Another new blog to add to the list. Check out Fr Justin's blog and say hello! I rather like his first post title - a quote from Catullus (with becoming modesty, he denies that it is polished... I note with pleasure that he promises it will be fresh and sharp though!!) Mantilla twitched in Fr Ray's direction. I knew I'd forgotten to mention another blog... Jay has a blog just for meditation themes which you can check out HERE. She appears to have another blog as well, but that's a private one. 1. Tyburn Convent. I love the relics of the martyrs kept in the Crypt, the fact that there is Perpetual Adoration before the Blessed Sacrament, and the fact that the nuns are proper nuns. 3. Brompton Oratory. Lots of marble, lots of gold leaf (or gold paint... can't tell), lots of statues and candles, very big and very trad. What more can a girl want? 4. 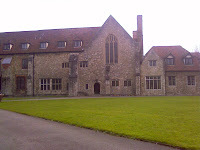 The Shrine of Our Lady of Consolation of West Grinstead. This little-known shrine is really something else. 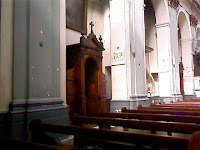 There is the hidden chapel which is in the atttic, and the presbytery has priests' holes. The priest would disguise himself as (what else?) 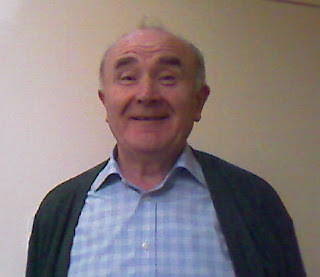 a shepherd, so the presbytery has been in constant occupation since before the Reformation. If you want to visit the hidden chapel, it is worth phoning to check if it is convenient (the chapel is upstairs in the presbytery, after all) but the church (which contains the picture of Our Lady of Consolation) is worth a visit too. 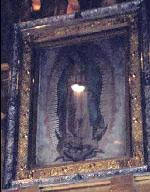 I did a post on Our Lady of Guadalupe a while back, after reading a book on the Apparitions and the miracle of the image on the tilma. This is no simple holy picture: all of the scientific investigation of the image has failed to reveal how it was produced, and examination of the eyes of the Virgin has resulted in mind-blowing discoveries. "...the image (the picture produced) does not come from any reflection, but literally comes from the inside of the image of the Virgin. The produced light is very white, pure and intense, different from habitual photographic lights produced by flashes. This light is encircled with a halo and appears to float inside the abdomen of the Virgin. This halo has the form and measurements of an embryo. In effect if we again examine more precisely this picture by making it turn in a sagittal plan, we perceive inside the halo some areas of shade that have the characteristics of a human embryo in the maternal womb." ...and then, as the discussion continued, I realised that actually there are loads of miracles, if you are willing to see them. 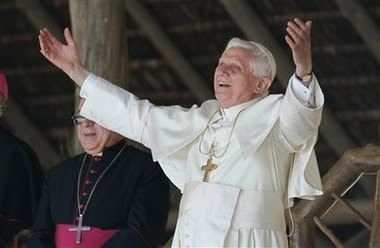 Ok, the vast majority will never be classed as "proper, authenticated miracles" by the Church (they're pretty difficult to prove, by the way... the Church is not the credulous, superstitious institution portrayed by the media!) but they are miracles to those who experience them nevertheless. But there are other miracles out there too, for those who will accept them. The type of miracle which has been attested to by doctors and scientists (medical miracles are the easiest to prove, because there is the documentation for "Before" and "After") oh, and don't forget that the panel of experts includes not only non-Catholic and non-Christian experts, but atheistic ones as well. How About This For A Great Photo? I really loved this one. 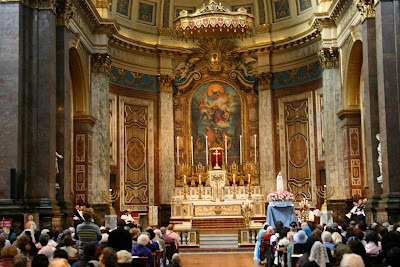 Twitch of the mantilla to Fr Z. ...O why is it soooo easy to burble away on this blog, and yet sooooooo hard to write a single coherent sentence on the supporting statement in job applications? ...yes, I'm job-hunting! Say a prayer for me if you get a chance! This made me chuckle... so I thought I'd share! Mantilla-twitch to the American Papist. It had to happen sooner or later... it would appear that the fems are protesting about being unable to join the elite Swiss Guards. 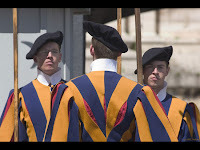 The Swiss Guard, founded in 1506, consists of 100 volunteers who must be Swiss nationals, Catholic, single, at least 174 cm (5 feet 8 inches) tall and beardless. New recruits are sworn in every year on May 6, commemorating the date on which 147 Swiss soldiers died defending the Pope during an attack on Rome on May 6, 1527. "The greatest love story of all time is contained in a tiny white host." The Tyburn Walk was very moving (sorry, pun not intended: I couldn't think of any other way to phrase it!!) My ankle has been playing up in the past week, so I nearly didn't go, but I find it such an uplifting experience to recall how the Martyrs were so firm in their faith that I just couldn't bear to stay at home. I was wary of injury though: I broke my ankle a couple of years ago and it took an inordinately long time to heal... and it flares up if I'm not careful. Given that I want to be reasonably agile by the time I go to Lourdes, I have to try not to overdo things! So I compromised. I walked for a bit of the way, and caught cabs at various points. Central London is great that way! I also got to chat to the cabbies about the Tyburn Walk, so I felt as though I was spreading the word. 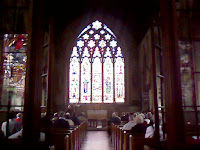 The first church we stopped at was St. Etheldreda's, Ely Place. I hadn't realised that there are two huge stained glass windows... (one was behind me) and there are several statues around the church showing some of the martyrs, including one of my favourites, St. Anne Line. I didn't have the opportunity to get any good photos though: I shall have to go back. 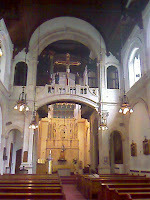 St. Anselm & St. Cecilia's is very impressive. It's a new church, built to replace the chapel of the Sardinian Embassy (the first public Catholic chapel to be opened in London after the Reformation, and the "Cathedral" of Bishop Challoner) It's not very noticeable from the outside: I had to give the cab driver directions! At St. Patrick's, Soho Square, we were blessed with the relics of St. Oliver Plunkett (the last martyr) and St. Cuthbert Mayne (the first seminary martyr) This was, for me, the saddest part of the pilgrimage: St Patrick's has become terribly run down and dilapidated over the years. I gather that they are desperate to raise money to restore the building. The final stop was Tyburn Convent itself. 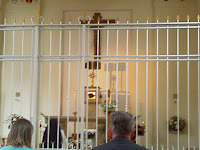 The photo shows the grille (opened just before Benediction) and just the other side you can see a nun (a proper one: habit and all) kneeling in adoration. 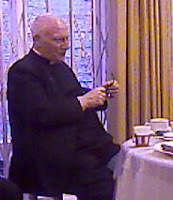 Right at the end, we had tea and sandwiches: here you can see Monsignor Stark, the Master of the Guild of Our Lady of Ransom. And two of the Sisters kindly agreed to allow me to take a photo... 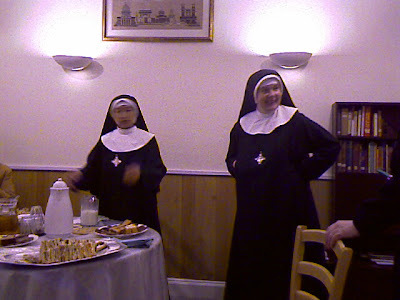 I think that the nun on the right is Mother Simeon, and the nun on the left is Sister Polycarp... but they were laughing like hyenas (I had explained that I wanted to put their photo on the blog) and I am left with the distinct impression that they may have been pulling my leg!! I was also delighted when, after explaining that I had my own blog to the gentleman acting as official photographer for the event, he asked me what it was called, and when I told him it was "Mulier Fortis" he actually said that he read it!